Booklet Panes & Booklets Collection, 1912-98, on stock pages in a binder ranging from 405b//1623BC neatly arranged and identified, good assortment of early n.h., features Scott 405b, 406a, 501b, 583a all n.h., also 463a with plate number, C10a and more, substantial face value, careful inspection recommended, excellent lot for the specialist. United States Modern Booklet Hoard, hundreds of unexploded booklets ranging from 1970-94 neatly identified in glassines in four file boxes, values to 29¢, duplication, extremely clean and organized. 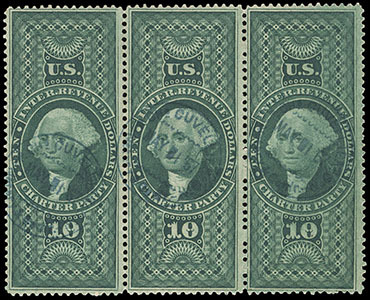 Special Delivery Issue Mint Group, 1885-1927, of 21 items, mostly high quality; includes E1 n.h., E3 x2 n.h. and l.h., E5 (line through variety) n.h., E7 x3 n.h., E8 x2 n.h. & l.h., E9 n.h., E11 n.h., E11 plate blocks in a pink back, E12a n.h., etc. ; couple plate no singles and many with certs., mostly very fine or better, Scott catalog in excess of $4,700. U.S. Locals, Confederate & Possessions Forgery Reference Collection, hundreds of items on pages in binders; includes a general range of carriers and locals including Sanitary Fair with genuine and proof, local mostly more common types with some scarcer and genuine running throughout, a bogus section with a very scarce genuine 5¢ Union Despatch issue (newly listed Scott #170L1), Canal Zone with an nice array of fake overprints, CSA with a few fantasy covers, Hawaii quite extensive with early Kamehameha forgeries including seldom seem multiple, Numeral with a array of forgery types, etc. U.S. Local Forgery Reference Collection, of about a couple hundred items on annotated pages in early album; mostly more common type forgeries with a few scarcer items, some good genuine, carrier items, reprint sheet, etc. ; a used group, worth review. U.S. Local Forgery & Misc. Reference Accumulation, couple hundred items in stockbook; U.S. local items including some genuine, mostly more common types with a few surprises, also some newspaper facsimiles, Hawaii Numerals and misc. foreign items. Official Stamps Accumulation, 1873-79, mint and used accumulation in stockbook including some better like O13 used, O14 unused, etc., high catalog value. 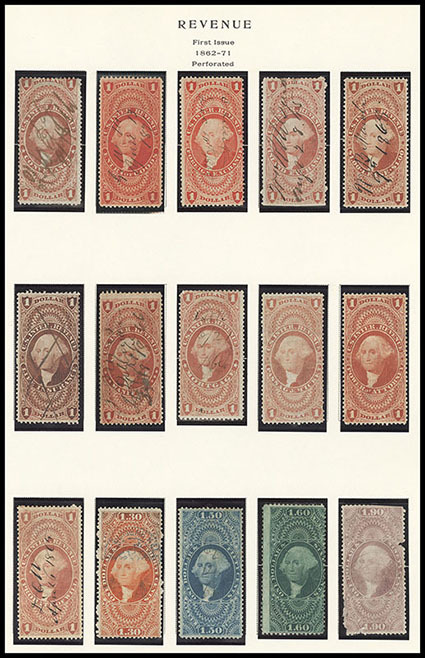 Revenue First Issues Collection, 1862-71, well formed assembly of issues on Scott album pages; with imperf issues virtually all 4-margin examples and missing only the scarcer issues, includes #R1a, R19a, 15¢-30¢ & 50¢-60¢ issues all present, $1 value complete including R71a, good higher values with $2 Conveyance and Mortgage, $3 Charter Party & Manifest, R91a, R94a, R98a & R101a, part-perf issues with a stronger showing than normally encountered with many wide imperf margin items and others needing to be checked, perforated issues appear to be complete to the $15 Mortgage lacking only the scarce 6¢ Proprietary and includes R98c, R100c & R101c; with condition well above the norm overall, an excellent basic for continuation. First Issue Handstamp Cancel Revenue Collection, over 350 stamps arranged on stockpages, from singles to multiples, containing a nice selection of handstamp cancellations, some railroad cancels, many cancels are identified by company, mostly on perf'd issues up to a $10 Charter Party strip of three; inspection recommended. Revenue Collection, housed in Scott album; starting with first issue imperfs including strong completion in 25¢-$1 values and good higher values including R85a, R89-91a, R98a, perf'd issues with complete 25¢-$1.90 issues and many of the high values present, 2nd issue complete to the $1 and mostly complete thereon to the $10, 3rd issue mostly complete to the $10, Documentaries with later issue lower and mid-values mostly complete, other issues in similar fashion including Wines, Playing Cards, etc.